At least three civilians, including a child of six, have been killed during fierce overnight fighting in the Somali capital, Mogadishu, residents say. A BBC correspondent in the city said the sound of the exchange of heavy weapons could be heard across southern Mogadishu for two hours. African Union (AU) peacekeepers say they responded after being attacked. Many mortars fell in residential areas. Islamist insurgents have recently been gaining ground from the government. An AU spokesman in the city initially denied that the peacekeepers had been targeted but others now admit they came under fire from mortars and heavy artillery. Local resident Farhiyo Sharif Awale said that the child was among those killed in their sleep when a shell hit their home near the AU base. At least eight civilians have been taken to hospital, medical sources told the BBC's Mohammed Olad Hassan in Mogadishu. The attack came ahead of a meeting by the East African region grouping, Igad, which is due to discuss the Somali crisis. The weak, Western-backed government only controls part of Mogadishu and a few other pockets of territory. Some 4,000 AU peacekeepers are in the city, backing up the administration of moderate Islamist President Sheikh Sherif Sheikh Ahmed. A recent upsurge in fighting has forced some 43,000 people to flee their homes in less than two weeks, the UN says. Islamist fighters on Sunday seized the strategic town of Jowhar. On Tuesday, eyewitnesses told the BBC that Ethiopian troops had returned to Somalia, four months after leaving. 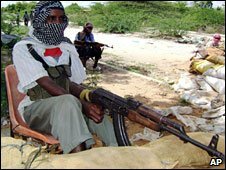 They had helped government forces oust Islamists from Mogadishu in 2006 but withdrew in January under a UN-brokered peace deal. Somalia has not had a functioning national government since 1991 and years of fighting have left some three million people - a third of the population - needing food aid.